When it comes right down to it, we've all got a bit of an adventurer's gene in our DNA. That's just part of being an American and living in a country strung together by bustling airports, a spiderweb of highways and thousands of miles of railroads. We live for exploration, the journey, the wild frontier. We also live for the hunt. It's more than a pastime or a hobby — it's who we are. So we at Petersen's Hunting got to thinking, what better way to celebrate this small piece of Americana than by choosing one lucky guy and taking him on the hog hunting road trip of a lifetime? That's when we teamed up with our friends at The Outfitters, a series by Ford on the Sportsman Channel, to find Justin Cannon, the quintessential Southerner from Henderson, Texas. Cannon just happened to spot a promo for the Ford Outfitter Insider Adventure Giveaway while cruising around on his computer, entered the contest and shortly thereafter landed the hog hunt of a lifetime with Petersen's Hunting TV host Kevin Steele. "I mean, I've never won anything in my life. Not a pack of bubble gum, not anything," Cannon said. "As a lifelong hunter, man, this is just a dream come true. I was thrilled to death to join Petersen's Hunting and Ford in California to be filmed. This is really a once in a lifetime deal." 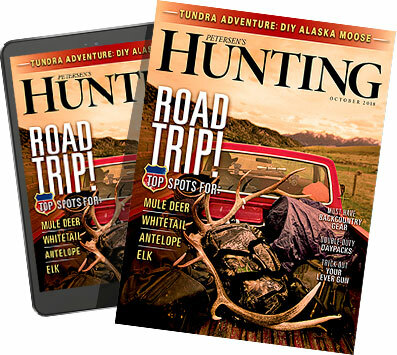 With our lucky hunter lined up, we had to ask: What is the ultimate hog hunting road trip? Where would you go and what would you take with you? What attractions would you see when you're not chasing hogs in the field? When you stop and think about it, one of the most important things to consider about any trip is where you're headed. If you're going through all the trouble to plan a destination hunt, you've got to make sure it's worth your while. Since we were looking for a great place to find hogs that had plenty of other excursions along the way, we chose California. If you've not experienced all the Golden State has to offer, consider just a few of the alluring features: the warm, sunny beaches of Santa Barbara or L.A., authentic Latino food that spoils you for life, or the golden hill country and wineries that make the state famous. There's also plenty of nightlife to soak in, surfing to enjoy and fine cuisine to please your palate. We scheduled an outfitted hog hunt just a few hours north of Los Angeles, in the hill country near Paso Robles. We planned our hunt with Jaime and Holly Smith of Wild Country Hunt Club. As the photos in the gallery below demonstrate, the golden barley hills and brush covered mountains form a scenic backdrop that's worth the trip alone. The hills, it just so happens, are also teeming with wild hogs and blacktail deer. Like location, it's easy to overlook another essential element for a road trip — your mode of transportation. Sure, you could pull a Clark Griswold and throw everybody in the lime green family truckster with fake wood paneling, but there's a better way to go. We enlisted the help of our friends at Ford, who provided us with an F-150 Limited. Trust me, there's not a better way to go when you're cruising through L.A. in style and traversing some of the nastiest dirt roads imaginable, all in one trip. Cannon, our contest winner, didn't have much to say when he first jumped into the driver's seat. Maybe that's because he was trying to keep his jaw from hitting the floor. The Limited, powered by the turbo-charged EcoBoost V6, has more than enough to make a grown man drool. The truck is equipped with 22-inch polished aluminum wheels, all-leather interior, navigation system and rear view camera, automatically deploying running boards and dual climate zones. And after a hot day in the field, the air conditioned seats might have been my favorite feature. While the .308 is probably the optimal cartridge for hog hunting, Cannon — just like his namesake — brought more than enough gun. Your options are plentiful when it comes to hog guns, but one thing is for sure: you typically can't have too much knockdown power. Hogs, especially the mammoth ones, are tough as nails. Cannon brought a real gem, his custom built .300 Remington Ultra Mag. He first purchased the gun for the Remington 700 action, which has since been trued, blueprinted and has a custom fluted bolt. Cannon added a Douglas air gauged barrel in Remington Sendero contour, a Timney trigger and a Zeiss scope. He used an H-S Precision stock with Cerakote finish, just to round things out. At the end of the day, the .300 RUM, as predicted, was more than enough gun to get the job done. With the expert help of our guides, Cannon locked on to some hogs, fired his canon and put the perfect cap on an already unforgettable trip. He ended up with a massive 300-pound porker, which beat all of his expectations. "It was an amazing trip. The Ford truck was amazing, and hanging out with the crew at Petersen's Hunting was a blast," Cannon said after it was all over. "Now if I could just do it all again, that'd be a major wow moment!" Be sure to check out the Ford Outfitter Insider Adventure Giveaway, where you can win one of six remaining hunting or fishing dream trips, as well as a chance to win the grand prize, a Ford F-150 with EcoBoost.